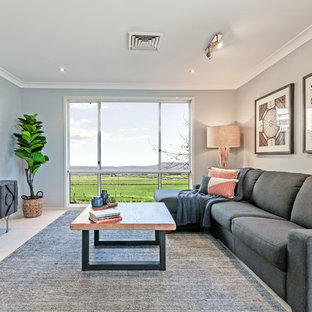 Transitional living room in Wollongong with blue walls, carpet, a standard fireplace, a stone fireplace surround, a built-in media wall and grey floor. Inspiration for a midcentury enclosed living room in Sydney with blue walls, medium hardwood floors and a freestanding tv. 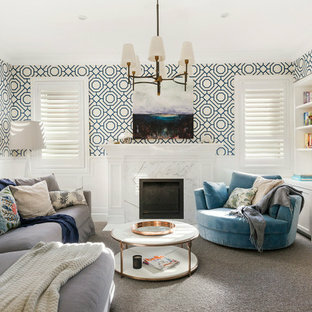 Inspiration for a traditional enclosed living room in Melbourne with blue walls, light hardwood floors and a corner fireplace. Mid-sized beach style open concept living room in Perth with ceramic floors, no fireplace, a freestanding tv, grey floor and blue walls. 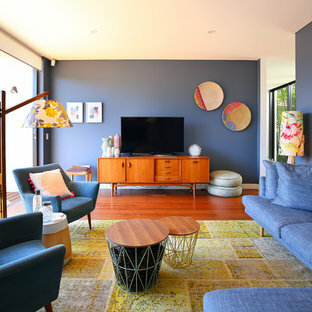 This is an example of a transitional enclosed living room in Sydney with blue walls, a wall-mounted tv and beige floor. 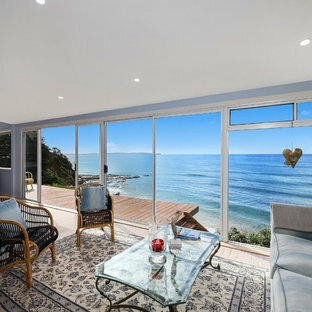 This is an example of a beach style formal open concept living room in Sydney with blue walls and light hardwood floors. 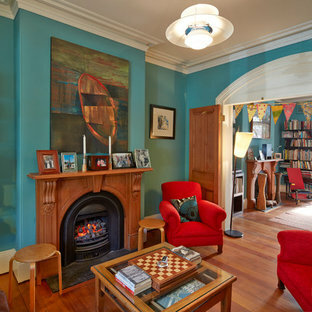 This is an example of an eclectic enclosed living room in Sydney with blue walls, medium hardwood floors, a standard fireplace and a tile fireplace surround. 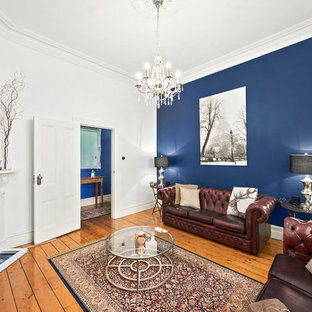 Transitional formal enclosed living room in Sydney with blue walls, carpet and multi-coloured floor. 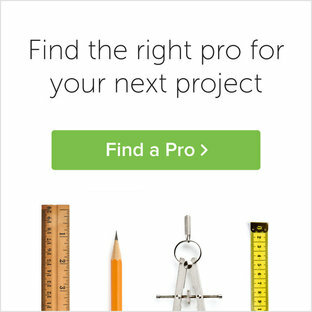 Design ideas for a transitional formal enclosed living room in Sydney with blue walls, medium hardwood floors, a stone fireplace surround, brown floor and a standard fireplace. Inspiration for a large transitional open concept living room in Sydney with light hardwood floors, a ribbon fireplace, a wall-mounted tv, blue walls, a metal fireplace surround and brown floor. 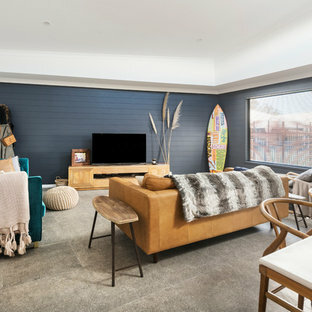 This is an example of a contemporary open concept living room in Sydney with blue walls, medium hardwood floors, brown floor, a ribbon fireplace and no tv. 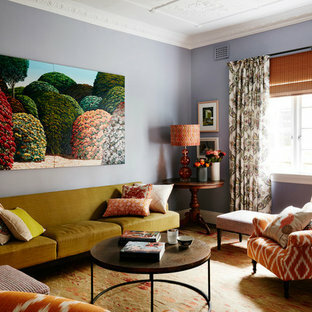 Inspiration for a large eclectic enclosed living room in New York with blue walls and light hardwood floors. Photo of a contemporary living room in Tampa with blue walls, a ribbon fireplace and a wall-mounted tv. Inspiration for a transitional living room in New York with a library, blue walls, medium hardwood floors and no tv. This is an example of a large traditional formal open concept living room in Las Vegas with blue walls, dark hardwood floors, a standard fireplace, a plaster fireplace surround and multi-coloured floor. Deep navy backdrop sets off this modern living room design. Perfect place to relax and spend time with family. This is an example of a small modern enclosed living room in Atlanta with blue walls, medium hardwood floors, a wall-mounted tv and grey floor. Inspiration for a large beach style enclosed living room in Portland with blue walls, dark hardwood floors, a standard fireplace and a stone fireplace surround.